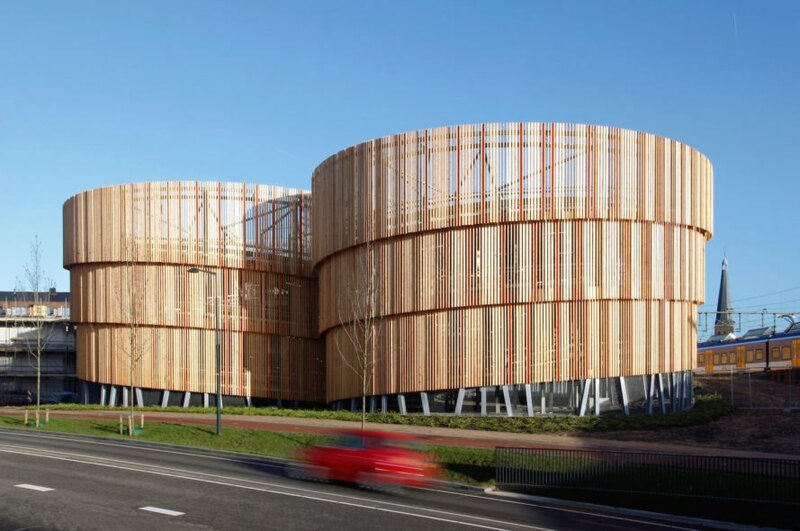 Park and ride buildings aren’t often beautiful, but this recently completed facility in Zutphen is a stunning exception. MoederscheimMoonen Architects created the stylish P+R facility near a railway station in the Netherlands’ Noorderhaven district. 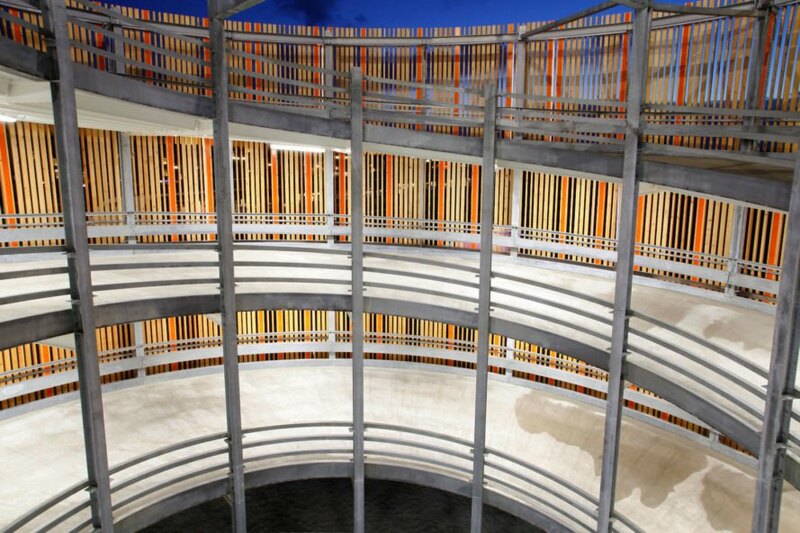 Built to reference the town’s industrial past, the contemporary building accommodates 375 parking spaces and has spots for over 600 bicycles. 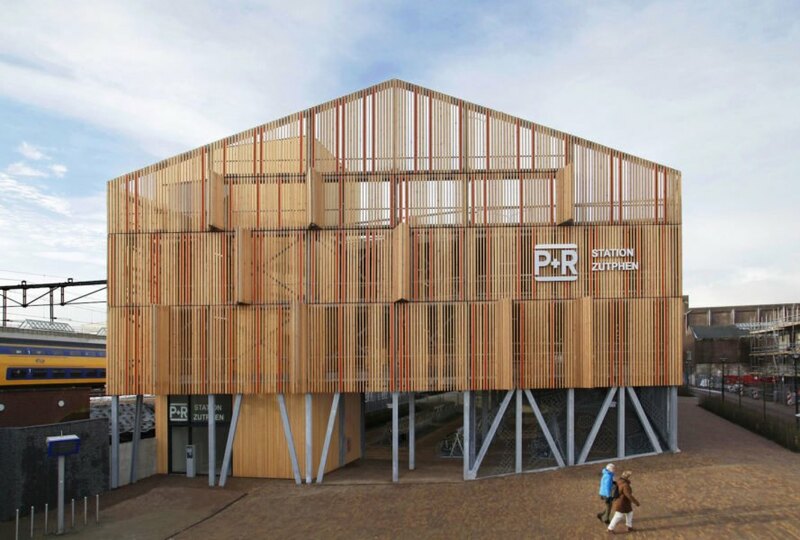 Located next to the town’s train station, the unique park and ride structure pays homage to the town’s historic warehouses and traditional industries through its design and choice of materials. One side of the building features a large gabled facade with wooden shutters to mimic the appearance of a factory warehouse. On the other side of the building are two helix-shaped ramps that hide the car’s vertical transport with a sculptural design. In a nod to the nearby steel bridge over the River IJssel, the structure is mounted on a series of “playfully positioned” galvanized columns. 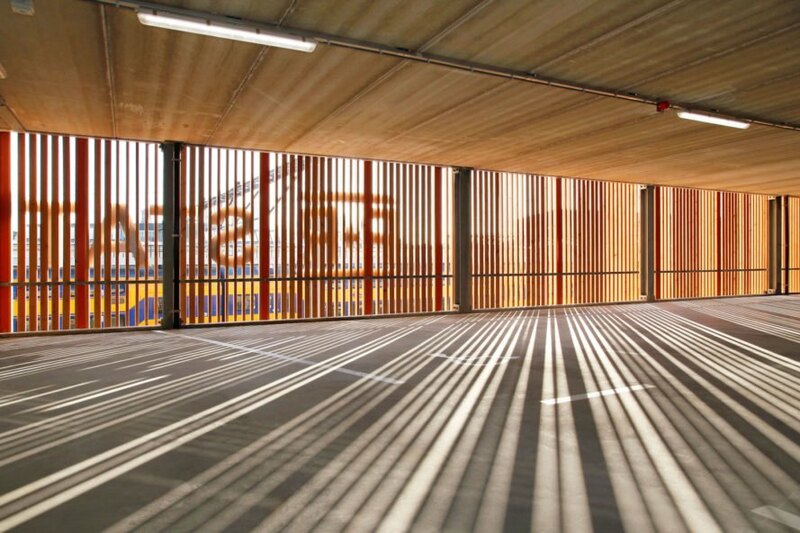 Ample natural light and ventilation passes through the building due to the slatted facade. The wooden slats were installed at different angles and combined with strips of red steel to create a playful and dynamic appearance. Vertical LED strips illuminate the building at night. 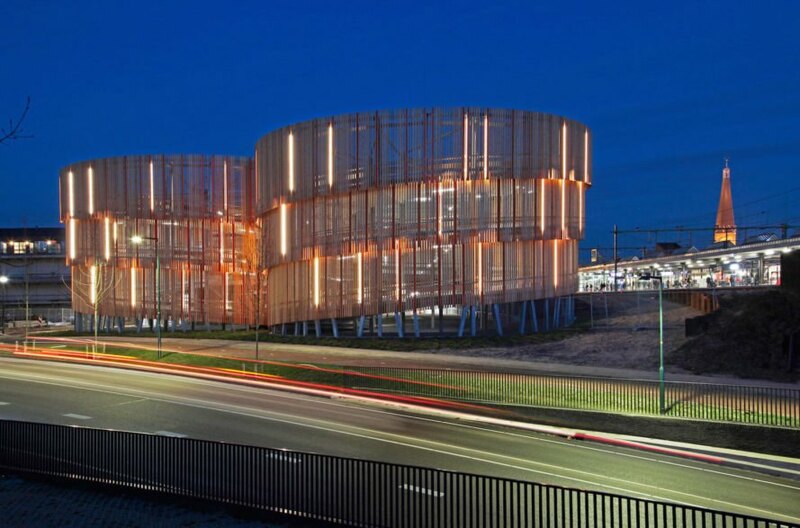 Located next to the town’s train station, the unique park and ride structure pays homage to the town’s historic warehouses and traditional industries through its design and choice of materials. One side of the building features a large gabled facade with wooden shutters to mimic the appearance of a factory warehouse. On the other side of the building are two helix-shaped ramps that hide the car’s vertical transport with a sculptural design. In a nod to the nearby steel bridge over the River IJssel, the structure is mounted on a series of “playfully positioned” galvanized columns. Ample natural light and ventilation passes through the building due to the slatted facade. The wooden slats were installed at different angles and combined with strips of red steel to create a playful and dynamic appearance. Vertical LED strips illuminate the building at night.